1] Fellowship is the religious interaction of church members among themselves and with God, a spiritual association through the Holy Spirit which transcends normal social or business relationships. Since this fellowship comes through being part of the body of Christ, it requires that one has repented, been baptized and, consequently, has received God's Holy Spirit. The fellowship of the brethren builds spiritual strength into both the individual and the Church as a whole. Conversely, the Church may exercise its right to disfellowship one who, by obvious attitude or action, opposes the gospel or causes disruption among the membership. 2] It is important that the membership of God's Church meet together for spiritual purposes in order that the fabric of the Church and the spiritual state of the individual may be strengthened. The Church also encourages social fellowship among the members. It is a well understood principle that close camaraderie between members of a group enhances both the conviction of the individual and the strength of the entire group. It is one means of practicing the qualities of love, outgoing concern and Christian harmony among the individual members of the body of Christ. 3] 1 Corinthians 12 shows that God deals with His Church as a group in addition to dealing with the individual members separately. "For as the body is one, and hath many members, and all the members of that one body, being many, are one body: so also is Christ" (v. 12). "For the body is not one member, but many" (v. 14). Likewise, John 15 gives the analogy of Christ being the "true vine," and explains how a branch separated or taken away from the vine cannot bear fruit. Experience has shown that people who cut themselves off from the Church (which is the body of Christ) tend to lose sight of the goal and purpose of God's Way and wither spiritually. They stop producing the fruit of God's Spirit, begin to shrivel in spiritual stature and can put themselves in danger of spiritual death. 4] The scriptures are filled with examples of God's faithful meeting together and fellowshipping. Jesus' own example was to spend long hours with His disciples whether in formal teaching sessions such as in the Sermon on the Mount (Mt. 5:1) or informally, as when eating a meal (Mt. 9:10-11). After Jesus' death, one finds constant reference to the disciples meeting together. Acts 1:13 describes the apostles assembled together "in an upper room." Acts 2:1 describes the believers as "all with one accord in one place" for the day of Pentecost. Other verses in Acts show Christians meeting together on the Sabbath day to hear the Word of God (Acts 13:14,42; 16:13). Likewise, the Church is exhorted not to forsake the "assembling of ourselves together" for religious worship (Heb. 10:25). Even specific instructions are given to the members to "greet one another with a holy kiss" (Rom. 16:16). This was a custom of the day and corresponds with the handshake of friendship practiced in our society. 5] Church fellowship is not an end in itself. The Church keeps clearly in mind the supreme goal and commission that God has commanded in Matthew 28:18-20 and 24:14 of preaching the gospel to the world. To reach the whole world with the gospel of Christ requires that the Church be a unified group, built of spiritually strong members, welded together in purpose, doctrine and love. The fellowship of the brethren helps build these qualities. 7] The key principle concerning Church fellowship is to realize that such associations among brethren are through God and His Spirit. "That which we have seen and heard declare we unto you, that ye also may have fellowship with us; and truly our fellowship is with the Father, and with His Son, Jesus Christ" (1 John 1:3). Thus the reason we have fellowship with each other as members is because we first have fellowship with Christ and the Father. Fellowship with Christ and the Father takes place because we have God's Holy Spirit living within us (Rom. 8:9). Once two persons of even widely disparate backgrounds have received God's Spirit and thus have communion and fellowship with God, they can fellowship in peace and harmony together-they now have shared characteristics between them; they have a common mental outlook through the Spirit of God and its "fruits" or qualities mentioned in Galatians 5:22. This "fellowship of the Spirit" (Phil. 2:1) is the bond that ties Christians together. 8] If one does not have the Spirit of God he is in the final analysis not really a Christian. "Any one who does not have the Spirit of Christ does not belong to Him" (Rom. 8:9). 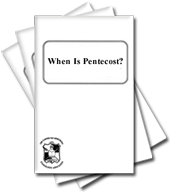 Formally, a member of the Church of God may be defined as a person who has received God's Spirit after repentance and baptism as outlined by the apostle Peter in Acts 2:38. 9] The Bible lists many ways which Church fellowship benefits the individual. The stronger members are expected to help those newer or weaker in the faith. "Brethren, if a man be overtaken in a fault, ye which are spiritual restore such an one in the spirit of meekness; considering thyself, lest thou also be tempted. Bear ye one another's burdens, and so fulfill the law of Christ" (Gal. 6:1-2). "Him that is weak in the faith, receive ye. . . " (Rom. 14:1). "We who are strong ought to bear with the failings of the weak, and not to please ourselves; let each of us please his neighbor for his good, to edify him" (Rom. 15:1-2). 10] We are also instructed to "exhort one another every day" (if need be) as outlined in Hebrews 3:13 and other scriptures. And Christians are reminded to pray for one another during times of physical duress such as illness or whenever there is need (Jas. 5:16-20). This helps build the Church into a tight family unit with everyone helping each other. 11] Peter admonishes the Church to have "love of the brethren" (1 Pet. 3:8). Christians are exhorted to forbear one another and to forgive each other (Col. 3:13), putting on "love, which binds everything together in perfect harmony" (v. 14). Members are instructed to "teach and admonish one another in all wisdom, and sing psalms and hymns and spiritual songs with thankfulness in your hearts to God" (v. 16). 12] The brethren are also urged and enjoined to help fulfill one another's physical needs. Indeed, "pure religion" involves sincere concern for the less fortunate such as widows and the fatherless (Jas. 1:27). And we must not forget the example of sharing as outlined in Acts 2:41-47. Here we notice that the brethren went to great lengths-even to the point of selling their personal possessions-to provide food and shelter for those needing help. Examine also Paul's statements in 2 Corinthians 8 about how God's people helped their brothers in poverty. 13] The fellowship of the brethren is an important topic. Social contact among members builds a unified church and serves to strengthen the members spiritually and physically, and in the process the entire Church becomes a more powerful tool in God's hands. In practice, such fellowshipping takes the form of informal chatting before and after services, visiting in each other's homes, attending to the sick and those who have physical needs, attending organized church socials, participating in athletics together, performing music together, etc. Baptized members of God's Church also bring with them to Church services and social functions their children and other nonbaptized persons in their family. The Church, of course, extends a warm welcome to any nonbaptized person who desires to attend its services or social functions. 14] To accomplish these same objectives of fellowship on a larger scale uniting our individual churches around the world, the Church of God maintains a newspaper for its members, which aids communication between them. It also supports a youth program for its young people. All areas of social contact, whether formal or casual, are used by the brethren to build love and camaraderie among themselves with the primary mutual objective being to bring the truth of God to the world so that others can share the spiritual richness of God's Church. 15] As stated above, in the final analysis our fellowship is through God's Spirit. Only God can give His Holy Spirit or take it away, but continued fellowship as a member in God's Church requires at least that a certain standard be met. God's Church is made up of those individuals who are sincerely striving toward salvation, and are earnestly attempting to exhibit every possible fruit of God's Holy Spirit in their lives. As a result, the personal lives of its members generally reflect the proper attitudes of Christianity. 16] But since all are human and subject to sin, each member is subject to being overtaken by wrong attitudes, thoughts or influences that need to be overcome. The Church appreciates the opportunity to deal in a constructive, positive and loving way with all those who need help. The ministry helps and guides the brethren in overcoming sins, no matter what the magnitude or nature of the sin may be, as long as the person is sincerely trying and indeed desires the help. (Such help can never be forced.) Just as Jesus taught that the shepherd will leave the ninety-nine sheep and go in search of the one that went astray (Mt. 18:12-14), so should God's ministers make every effort to save any member who has "gone astray." 17] Unfortunately, for complex reasons, some individuals occasionally harden themselves to sin and continue defiantly in it. They may even influence others to follow them to act the same way, in spite of all the efforts of the Church to guide them in a positive manner. These persons sometimes become bitter and attack or malign the very ones who love them the most-those who are trying the hardest to help them, namely, the other members of the Church and the ministry. 18] The Church at these times recognizes its responsibility to protect the congregation by withdrawing its fellowship from the dissident for the good of the Church and ultimately for the good of the individual himself. This disfellowshipping is not to be equated with, and is totally different from, ostracism, court-martialing, legal sentencing, cursing, or the like. It is not a means of revenge or the exercise of a personal vendetta. It is simply a tool to protect the Church and to reawaken the individual. Yet disfellowshipping is not a frivolous thing: it is done only after all else has failed, when the person is adamant in not repenting of the wrongdoing. 19] The Bible itself gives the Church both the example and the authority to disfellowship militant dissidents and sinners. Paul makes it plain that one who absolutely refuses to repent of his sin should be removed from the congregation for the good of all (1 Cor. 5). 20] Anyone who intractably refuses to obey God's Church and ministry is to be warned as a brother, but is not to be looked upon as an enemy (2 Thess. 3:15). As Paul wrote "note that man, and have nothing to do with him, that he may be ashamed" (v. 14). 21] Other individuals may choose, for whatever reason, to voluntarily withdraw from recognized fellowship. These people are no longer considered a part of the organized Church, but they are not to be shunned so long as their behavior appears upright; their ultimate spiritual state can only be judged by God. 22] Whenever a disfellowshipped individual repents before God of his sin or wrongdoing, he must be forgiven and comforted by the congregation or else he could be overwhelmed by excessive sorrow (2 Cor. 2:7). The Church takes great pleasure in accepting back into its fellowship any disfellowshipped person (no matter what the offense) once that person has truly changed his behavior, demeanor and/or disposition of mind. The person need not repent before the congregation, nor to any individual member; repentance is toward God not man. Of course, the fruits of repentance-the person's attitudes and actions-must give evidence that the repentance is indeed genuine. It is the Church's utmost desire that any disfellowshipment will help stir repentance in the sinner and restore him to love and harmony within the congregation. The Church and its members must be quick to forgive and forget the sins of any disfellowshipped or inactive member upon his repentance. Such a person should be received back into the congregation with joy, making it as easy as possible for the member to be returned to fellowship.